Viggo Mortensen has one of those faces that's notoriously hard to capture. 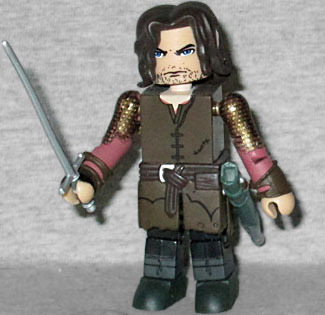 ToyBiz spent years making Lord of the Rings figures, and never really made an Aragorn that looked like him. NECA couldn't even do it, and that was on a 20" figure! The Minimate doesn't look very much like him either, but then, they never do. Some of the caricatures are quite good, but this... isn't. It's eyes and stubble. Could be anyone at all. He has stringy hair, and his only add-on pieces are his bracers (the ones he took from Boromir's body) and the lower edge of his shirt. 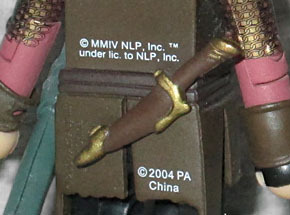 The bottom of the skirt is tattered, and it has a sculpted belt with a dagger at the back and a hole on the left side to plug in his scabbard. It's so long, in fact, that it has to point backwards or he can't actually stand. 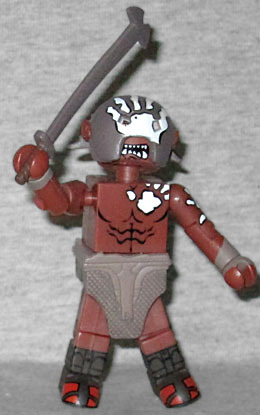 The berserker Uruk-hai lives up to our expectations of that name by being shirtless. He's a reddish-brown, with painted sandals and bracers, plus black lines for anatomy and a molded skirt. There are white handprints on his chest, arms and mask, and they look like actual handprints - five fingers and all that. You may think that would go without saying, but remember that Minimate hands (and thus handprints) are just round clamps, but that might not have read right on the figure. People would be wondering why there were crescent moons stamped on the figure. He carries a rough-looking sword that splits in two barbs at the end, and his helmet is removable to reveal his monstrous face beneath.